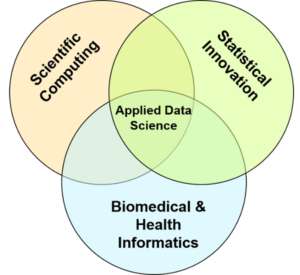 In AstraZeneca, applied data science lies at the intersection of scientific computing, statistical innovation, and biomedical & health informatics. Since it’s unrealistic to expect everyone involved in medicine development and delivery to be expert in every area, the Scientific Computing Solutions team asked itself one question: How do we get simple, robust, user-friendly tools into the hands of non-experts quickly and reliably? The answer lay in reducing complexity. For nearly 300 statisticians needing to use Bayesian tools to compute the probability of success of clinical trials. This meant creating an R package and deploying RStudio Server, ensuring everyone had the same tools and methodology. This package provides standardized and tested calculations, based on using prior data for drug effect size, deriving a Bayesian posterior distribution, and then simulating subsequent clinical trials. Another problem the team had was the need to deploy various interactive tools. These have been built on Shiny Server Pro, which has provided enterprise-quality deployment capacity for Shiny applications. The use of Shiny to simplify the sharing of analyses with non-experts has rapidly exploded around the whole business. According to Paul Metcalfe, Scientific Computing Director at AstraZeneca, “RStudio just works.” For most data science projects, being able to use modern high-quality tools was a great advantage. The ability to control access to individual applications with Shiny Server Pro was also very important. So far, the use of R, RStudio, Shiny, and Shiny Server Pro has allowed the Advanced Analytics Centre to explore historical clinical trial data for cardiovascular trials, to provide interactive tools for the design of clinical trials in oncology, and to provide interactive tools for go / no-go decision making across the whole drug portfolio. NOTE: This “spotlight” was based entirely on a presentation by Paul Metcalfe at the UseR!2015 Conference on July 2, 2015, Aalborg, Denmark..